The 16-hectare Hintersee is located near Ramsau on the border of the Berchtesgaden National Park, with high mountains to the west and south. Numerous boulders are strewn over the flat shore area, part of which is wooded; on the south side are meadows. The main attraction of this lake is its position below the steep walls of the Reiteralm and Hochkalter, which are reflected in the water's surface on clear days. It is not surprising that, from 1850 on, this beauty spot became a magnet for painters. By the Hintersee they found what they had been looking for: a natural idyll far from the town. Today the magnificent scenery of which the lake is a part attracts thousands of holidaymakers every year. The area is particularly popular among walkers with its excellent network of hiking trails. 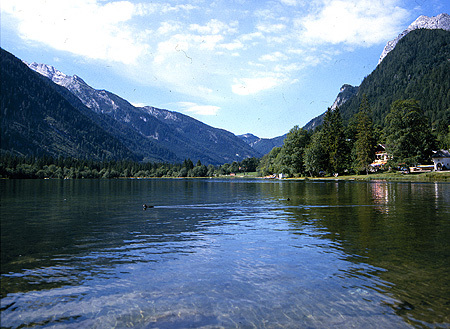 The Hintersee is located around 12 km west of Berchtesgaden. It can be reached on the St2099, which branches off from the B305 from Berchtesgaden to Bad Reichenhall. Paths round the lake; path from Datzmann through the Zauberwald to the Hintersee; steep trail from the Hinterseer Seeklause to the Blaueishütte (1680 m) – a full day's walk.